Around midnight the magazines in a shop come to life. 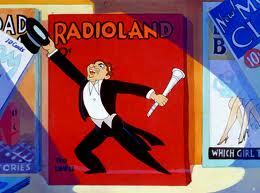 The radio star plays music before Radioland takes over. A beaver from Outdoor Life slaps a bass, and The Dance starts having a good time. Two boxers dance in The Ring and Child’s Life applauds. Hugh Herbert enjoys himself too. (Behind him, is a note stating that he was in Coo-Coo Nut Grove) Leopold Stickoutski conduts the storm and our title song begins, being joined by some singing tongue sandwhices and lobster/oyster castanets. Gang magazine robs Wall Street but soon confesses to Confessions. He is sentenced to Life magazine. He goes to the other magazine nearby (Liberty) and breaks free. Walter Snicthall (Twitchell) alerts everyone everyone is on the alert. The Thin Man and his Dog(world) find him hiding in Better Babies and he runs. He is lassoed by Western Story, trips over Greta Garbo’s feet and lands in “Twenty thousand years in Sing-Sing”. Hugh laughs at this and the crook drops a globe on him. He then laughs in the same manner Hugh did.